Anyone dealing with severe allergies always carries an EpiPen. In an emergency it provides an injectable dose of epinephrine to narrow blood vessels and open airways to help minimize the dangerous symptoms of an allergy attack, and when used with the new Veta case that's designed to safely store the EpiPen, it can automatically let your family or friends know when you're having an allergy attack. The Veta is designed to replace the standard plastic cases that EpiPens are carried and stored in, introducing both Bluetooth and a small assortment of sensors. 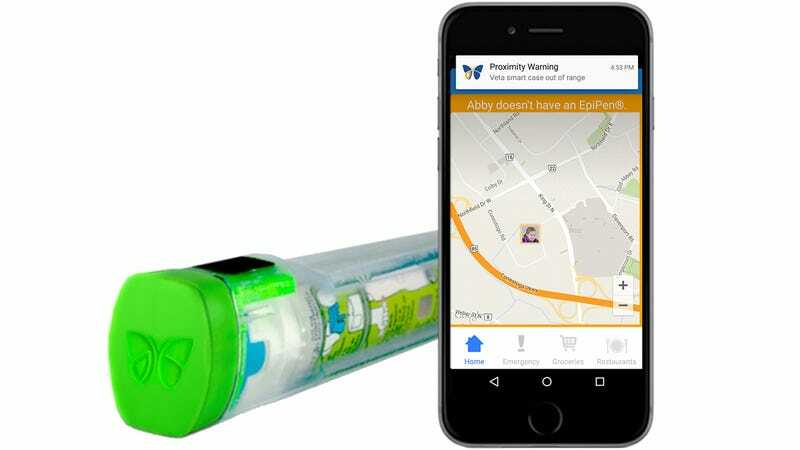 When connected to a smartphone with a mobile data connection the Veta will automatically communicate to an accompanying app when the case has been opened, and the app will then alert friends or family, (or whoever the user wants to be notified) that the EpiPen has been used. But tipping off your contacts about having a severe allergic reaction isn't the only reason to swap your EpiPen's standard case for the Veta. When opened it can also issue audible alerts and instructions to assist strangers, or those not familiar with how to use an EpiPen, on how to administer the medication. The case even incorporates a sensor to measure extreme changes in the EpiPen's temperature which could compromise the effectiveness of the epinephrine, and then alert the user via their smartphone that they might need to replace it.